“Eat it fresh … eat it raw … eat it …” is Off the Hook’s signature motto. You don’t have to tell me twice … or three times! With a palate accustomed to off-the-boat, pricey sushi, sashimi and seafood from San Francisco, this easy-on-the-pocket sushi joint not only meets, but exceeds my taste buds’ expectations. Many locals will insist that this is the best sushi in town! Not only is Off the Hook vegetarian-friendly, it offers creative, California-influenced sushi and sashimi combos that, to date, I have not been able to find anywhere else. The venue is modern and trendy; the wait staff is wholesome and laid-back. Do not leave for home without trying the Shrimp Dynamite – the name says it all! 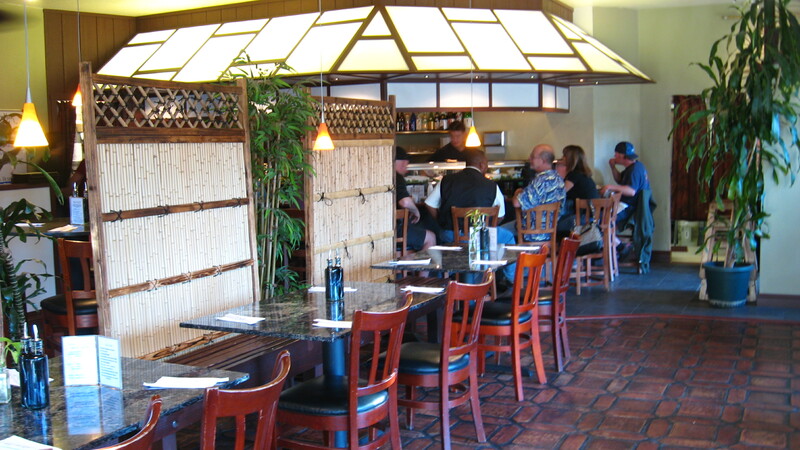 Monday – Friday 4:30 – 6 p.m.
Must be seated by 6 p.m. sharp! While all the Happy Hour rolls are knockouts, my favorites are the Crunchy Granola, Hula Girl, and Mac Daddy.